Take a walk on the dark side with this screenprint by artist Tom Whalen, featuring a montage of all your favourite bad guys from The Hobbit motion picture trilogy. Produced through Weta Workshop in cooperation with Warner Bros, Tom Whalen has created this striking screenprint, officially licensed for The Hobbit films. 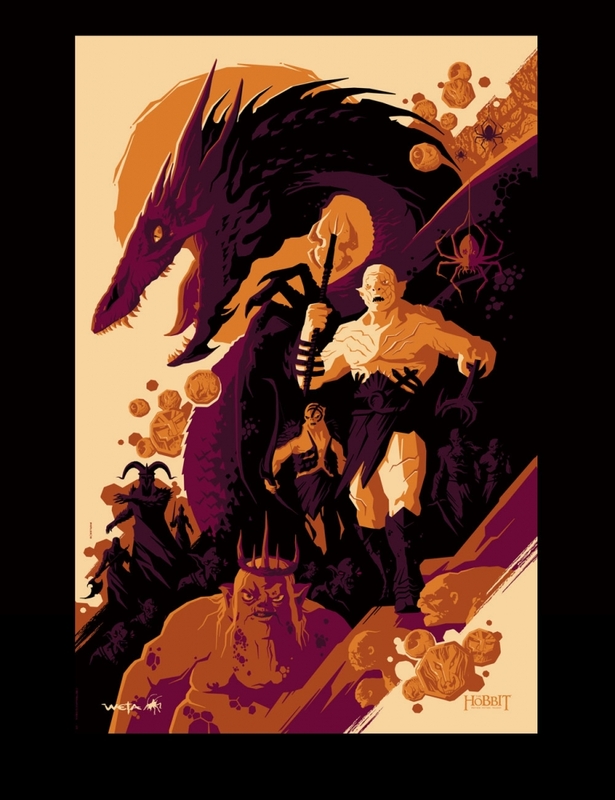 Available in tones of orange, the poster is a wonderfully creative rendering of some of Middle-earth's most enticing evil-doers: Azog - Commander of Legions, Bolg, the Ringwraiths, the Goblin King, goblins, trolls, orcs...and last (but most certainly not least), the one dragon to rule them all - Smaug the Terrible. Well, not really. But he gave it a good go. And in THIS poster, he rules the roost. Perfect for displaying on your wall, or for warding off those pesky elves and hobbitses. Because everyone knows bad guys have all the fun.